We recently had family to stay to help out with some our our pre-season jobs. 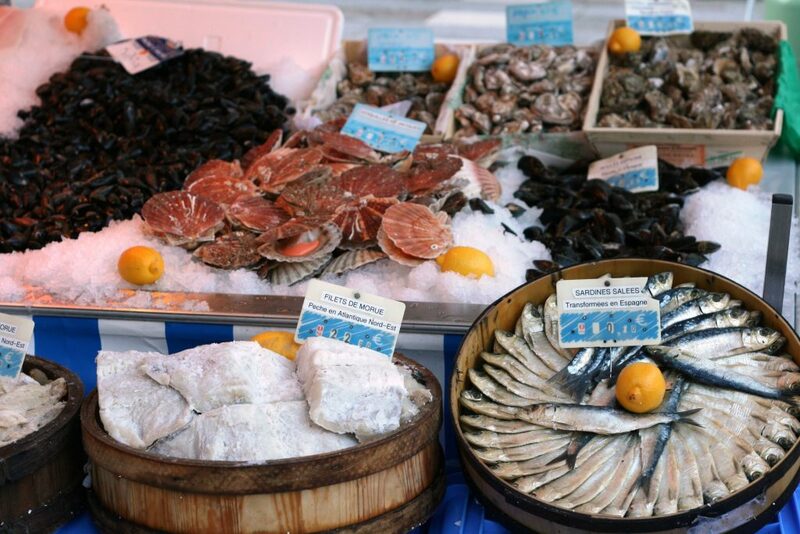 As a tasty reward, we visited the wonderful fish stall on our Saturday market to make this luxury fish pie. You need a total of 675 grams of fresh fish & shellfish for this dish, this was my choice from the catch of the day. This recipe will make a fish enough for 6 hearty portions. 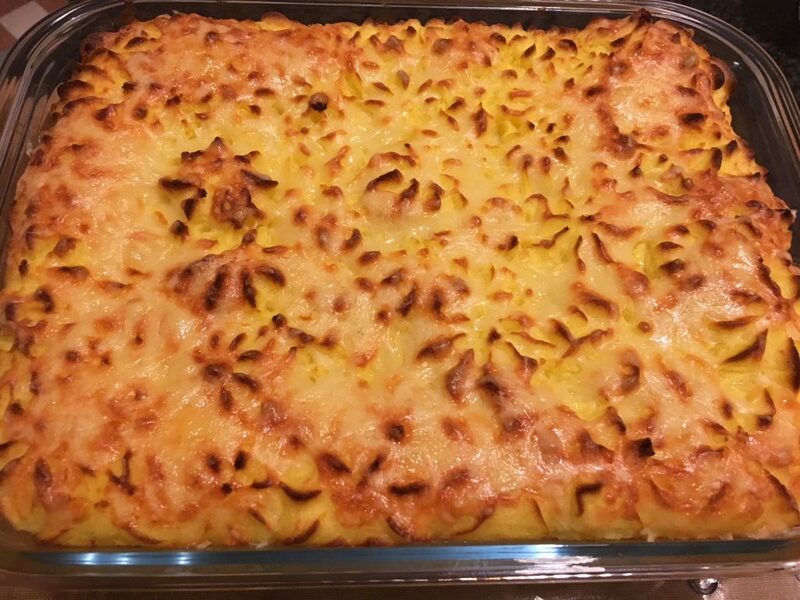 If you are making this dish for the first time, there are a few steps to follow but the results are really worth it. 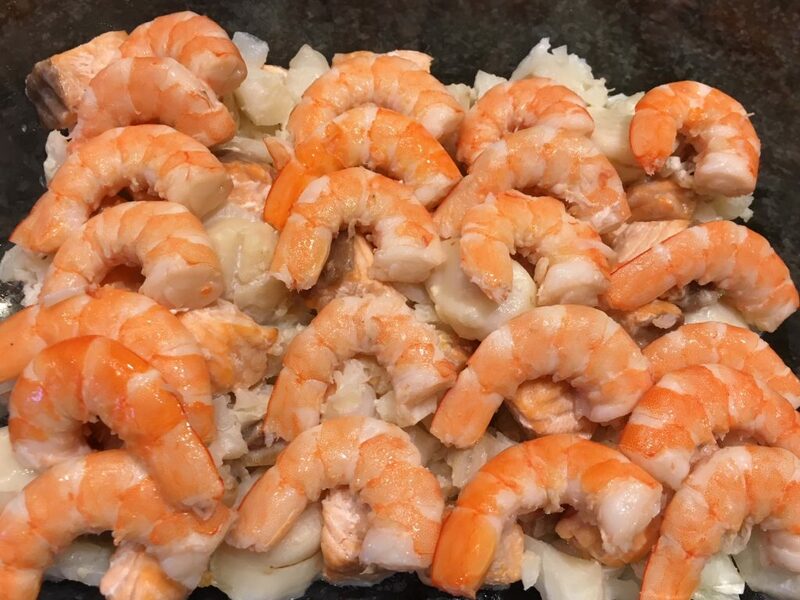 To start, prepare all of the raw fish – peel the prawns but keep whole, if the scallops are large cut in half and the fish you want to be in cubes of around 3cm. Butter the sides of a large ovenproof dish (1.75 litre minimum) & set aside. If using them (they add an extra taste & texture) hard boil the eggs for 8 mins; peel, quarter & set aside. Place the cream, milk, onion & bay leaf in a large saucepan or wok and slowly heat. When the milk is warm, add the fish & shellfish and bring the liquid up to boiling point. 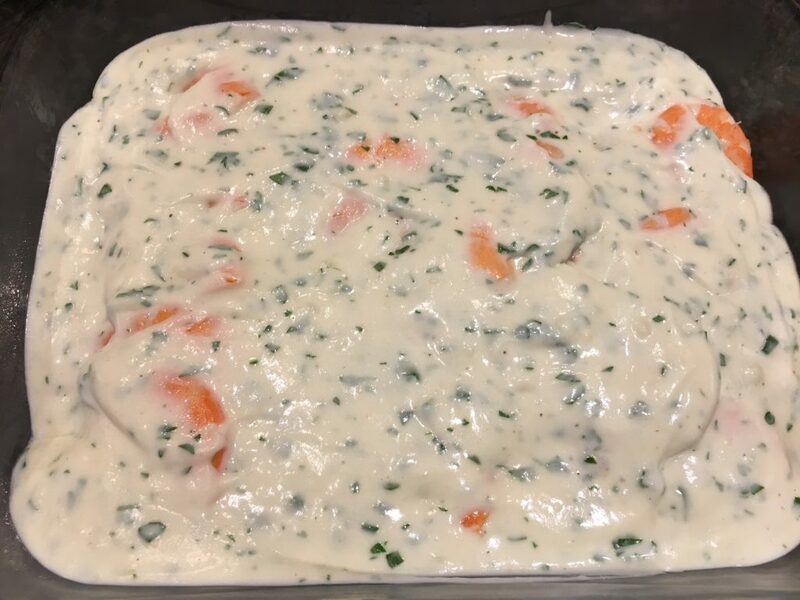 Remove the fish with a slotted spoon and layer in your baking dish (along with the boiled eggs if using them towards the middle of the layers); strain the milk/cream into a large jug. Using a clean pan/wok, melt the butter and then add the flour, cook (stirring continuously over a med heat) for 2 mins and then slowly add in the reserved milk/cream to make a velvety smooth sauce. Finally add the seasoning and the freshly chopped parsley. Pour the sauce over the top of the fish; allow to cool slightly then place in the fridge for at least an hour. Peel and quarter the potatoes and place in a large pan of cold water with plenty of salt. I also add a few strands of saffron which give a nice colour and a delicate flavour which is perfect for fish. Bring to the boil and test with a knife after 15 mins – you want the knife to pass easily through the potato. Strain and allow to sit for a couple of minutes to remove as much moisture as possible. To make the mash topping, if you have a potato ricer it is ideal, if not your standard hand-masher is fine – you want as smooth a mash as possible. Add a little cream or milk, a good knob of butter (you can also add a couple of egg yolks which give a good consistency if you are piping) sea salt & some white pepper to taste. If you are not piping the mash, it needs to be a consistency so that you can spread it easily with a pallet knife. Spoon or pipe the mash on top of the fish/sauce, brush with the reserved egg yolk and top with grated cheese. Bake at 200 degrees C for 20 mins until golden brown & piping hot.